Hope everyone enjoyed their Memorial Day. Most of the state stories related to the holiday involved governors signing bills benefitting veterans -- giving them free college tuition in Wisconsin or health benefits in Illinois, for example. President Bush signed a law banning funeral protests at national cemeteries. Colorado Gov. Bill Owens (R) did the same last Friday. But one story that caught my attention comes from Michigan, where sticklers for flag etiquette are colliding with the supporters of veterans. Now, normally, I imagine, these are two groups that don't disagree often. I mean, we're talking about patriotic people on both sides here. The controversy? An order by Gov. Jennifer Granholm (D) to fly flags at half staff every time a servicemember from Michigan dies. But critics of the governor's policy want to halt such flag honors, saying they violate the U.S. Flag Code. They contend that the code's compilers never intended flags be lowered for soldiers but only high-ranking government and elected officials. "The world seems to be caught up in this frame of mind where it's not enough to say we're sorry (for a death) to show our compassion and our patriotism," said Bruce Butgereit, of Kentwood, national patriotic instructor for the Sons of Union Veterans of the Civil War. "We are now taking it upon ourselves to use our national symbols to stretch the Flag Code to its limits." The story comes from the Washington bureau of Booth Newspapers in Michigan (they have the Ann Arbor and Kalamazoo papers, among others). Since December 2003, Granholm has awarded flag honors for 67 fallen soldiers. The proclamation starting the practice was signed into law nine months after the war in Iraq began and was prompted by calls from families and local officials. So far, 84 soldiers from Michigan have been killed in the war. "The U.S. code provides the governor with that option, and the governor has chosen to exercise it," said Liz Boyd, Granholm's press secretary. "Where is the controversy in honoring brave men and women who are fighting for our freedoms in Iraq and Afghanistan? The controversy is lost on me." For Jeannine Trybus of Grand Rapids, the controversy isn't about what's due brave soldiers, but rather, what is established U.S. tradition. She says a review of the history shows that individual soldiers weren't supposed to be honored this way. "I think every time that flag comes down it cheapens the gesture," said Trybus, who also objected to the president lowering flags for Katrina victims. "I don't believe the soldiers expect this. There are so many people denigrating the United States. I don't think we should be part of that by denigrating one of our own symbols and its meaning." There's a lot more to this story, and it could actually pop up elsewhere. The story says governors in more than 12 states -- it lists Illinois, Indiana, Wisconsin and Minnesota but not the others -- have similar orders. And Granholm's GOP opponent said he would stop the practice if he were elected governor. Today former Illinois Gov. 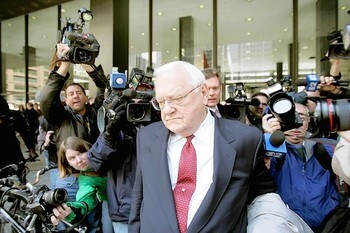 George Ryan (R) was found guilty on all charges in a massive federal corruption trial. It's undoubtedly an historic moment for Illinois politics. It further catapults star prosecutor Patrick Fitzgerald of Plame Leak Probe fame into the national spotlight. Perhaps it'll send a message to Illinois politicians -- or Illinois voters -- that enough is enough. (Although Ryan is the fourth Illinois governor since the 1950s to be indicted after office; three were for official acts; one was acquitted. On top of that, Gov. Rod Blagojevich's (D) administration has had its hands full with federal investigations, although none has implicated the governor himself). For me though, it takes me right back to the start of my journalism career. In college, we invited every gubernatorial candidate to talk to the editorial board of The Daily Illini. Three of the four Democrats came by. George Ryan, the lone Republican in the race, did not. So I was especially happy that my graduate class at UIS was able to interview him in the fall of 1999, less than a year into his term as governor. It was the last time a governor sat down with that class, even though it had been an annual tradition up until then. Ryan's legal troubles only grew after our interview. RYAN: People that sell licenses illegally and take money and contribute it to my campaign, I don't know that they sell licenses illegally, if that's what your question is. How would I know that? If I knew that, I wouldn't tolerate it. Are you saying that you think I knew ... that they were doing this illegal act and I did it anyway? RYAN: No, you're asking the question. Don't blame the readers! You need to make your question a little clearer. I mean, are you accusing me of doing something here? RYAN: Well, then, I don't understand what your question is. I would have no way of knowing, any more than Jesse White [who succeeded Ryan as secretary of state] would know that the last person that put $500 in a cigarette pack and handed it to a postal inspector. That's what happened in the last sting they just had. So how would he know that? He would have no way of knowing that, just like I would have no way of knowing that. RYAN: No, I don't understand how anyone would wonder that... Do you know what these folks do at night? Do you know if they're out doing anything illegal? Well, you work with them everyday. Do you know that? They're not employees of yours, but I don't understand how... I've got 4,000 people who work for me at 132 facilities, I think there were when I was secretary of state, up and down the state. And there wasn't only bribery going on, we had a lot of arrests that we made. We had people selling cocaine and drugs out of facilities in the state. We had false ID cards that were made that we went in and worked ... I mean I don't understand your question. Where we knew and could find and uncovered wrongdoing... And it happened and it will continue to happen, I'm sure, to some degree. I don't know what you do about it other than try and follow up and carefully monitor it as much as you can, but it still goes on. And you wonder why they didn't put him on the stand. Needless to say, Ryan left quite an impression on me. Clearly, he was brash. He liked to control the conversation. He bristled at the notion that he was in the wrong. I thought of that conversation many, many times since first meeting Ryan. All the times the press swarmed around him and, if he stopped to talk, lashed out at the reporters, sometimes in very personal ways. All the times I went home and people just wanted to know if the governor was going to be indicted. The fact is, the people did want to know how he could claim he didn't know what was going on with his own employees that benefitted his own campaign. They didn't buy the line that the corruption was ingrained in the workers of the secretary of state's office. (It's worth noting none of the charges Ryan was indicted of involved selling licenses for bribes.) And yet George Ryan seemed to become more and more irate, angry, even hostile toward the press, the feds and anyone who questioned the integrity of his office, his friends or himself. The attitude only convinced more people he was guilty of something, even if they didn't know what. I thought about that conversation when I witnessed George Ryan commute all the death sentences in the state just days before leaving office. Romans bathed the Coliseum in golden light when Ryan took those men and women off of Death Row. But back at home, a lot of Illinoisans I knew wished they were there when that woman threw a pie in his face in southern Illinois. Even today, hecklers taunted Ryan as he left the federal courthouse. A little humility may have helped him, probably not in the legal sense, but certainly in the legacy sense. Otto Kerner went to prison and people still remember the work he did in race relations. Some think he was wrongly targeted. But the fact that George Ryan accomplished a lot in a four-year term -- a major capital program, gambling expansion, death penalty reform -- could well be lost on future Illinoisans. "Are you accusing me of doing something here?" She wasn't the only one asking, governor. And she certainly wasn't the only one disappointed with the answer. Justice Mary Ann McMorrow of the Illinois Supreme Court announced yesterday that she was stepping down from the court. McMorrow was the first woman elected to the high court and the first woman to head any branch of Illinois government when she served as chief justice from 2002 to 2005. I spent more than five years covering the Illinois Supreme Court for the Chicago Daily Law Bulletin, and I have to say, all the stories about McMorrow being a gracious, intelligent and hard-working judge are all true. Although I'm sure she got a little annoyed when I'd pepper her with questions after she testified at budget hearings, she was always pleasant and forthcoming. Earlier this year she realized, "I don't want to read briefs for the rest of my life. I want to travel. I want to get into a whole new exercise regimen so I can walk as I should." McMorrow always told me to go to law school, and I was always wondering if I wanted to read briefs for the rest of my life, too. haha. Anyway, she's a classy lady and I hope she has a rewarding retirement. She certainly earned it.